Asphalt Industries is your go-to source for residential and commercial asphalt paving services. Our vast experience and dedication to quality lend themselves to every paving assignment we’re part of. We also provide excavation and drainage services as needed. Contact us today for a free quote. Not every asphalt contractor in Saratoga Springs, NY is equipped to take on large-scale commercial projects. In fact, few come close to rivaling the capabilities and experience of Asphalt Industries when it comes to bigger, more demanding asphalt projects! That’s why we’re the number one choice for paving in the area. Our teams come equipped with the expertise, equipment and understanding of large-scale asphalt jobs, giving us the power to deliver results that are simply unparalleled. From paving and sealcoating for expansive parking lots, to excavation and drainage services before paving a lengthy private drive, we do it all. 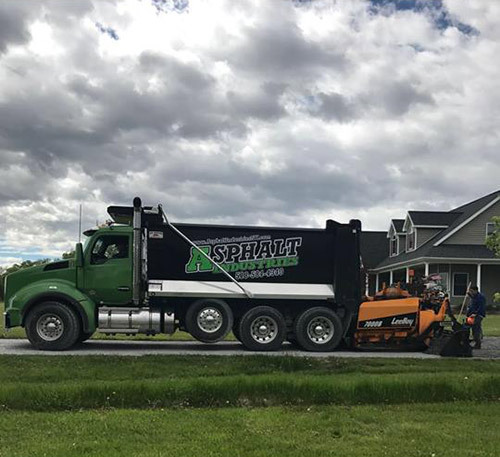 When you choose to work with an Asphalt Industries paving contractor in Saratoga Springs, NY, you’re also going to get a level of customer service and expertise that’s unmatched. Our experienced professionals get to know the full scope of your project before we get started, so we can determine the best approach to excavating and paving. This also allows us to implement a process that helps cut cost and time, so your project comes in on time and within budget. We can even work with you to provide excavation and drainage services. We don’t subcontract this work, either—our capabilities allow us to do it all in-house! The result is a job well done by our team, backed by accountability and consistency that can’t be beat. We invite you to call us for your next asphalt project and see for yourself why we remain the local leaders in this industry. We’re ready to take on commercial and residential jobs of all sizes. Our business is family-owned and –operated, built on values of integrity and honesty. We’ve been in business since 2001! We’re ready to offer you a free estimate on your upcoming project. If you’ve got an asphalt project coming up, Asphalt Industries is ready to help. Contact us today to consult with one of our skilled professionals. We’ll happily provide you with a quote! "John and his team did a fantastic job from the moment I called him until the last second they left my home. They did a phenomenal job resurf..."
" john recommended what I needed and understood what I wanted. I cant say enough about john and his guys. he did exactly the job that I wante..."
June 23, 2017 Stacy L.
"Nice guys, great job, and a good price. Thank you!" "John and his team did a terrific job on our driveway at a very reasonable price. They were very efficient and the whole process went very sm..."
May 12, 2017 Vicki Y. "I hired asphalt industries to pave my driveway and they did an amazing job! They stepped me through the whole process so I didn't have to mi..."